Paul Manafort was back in federal court on Friday in the Eastern District of Virginia, where Judge T.S. Ellis ordered a sentencing date for February 8th at 9am. 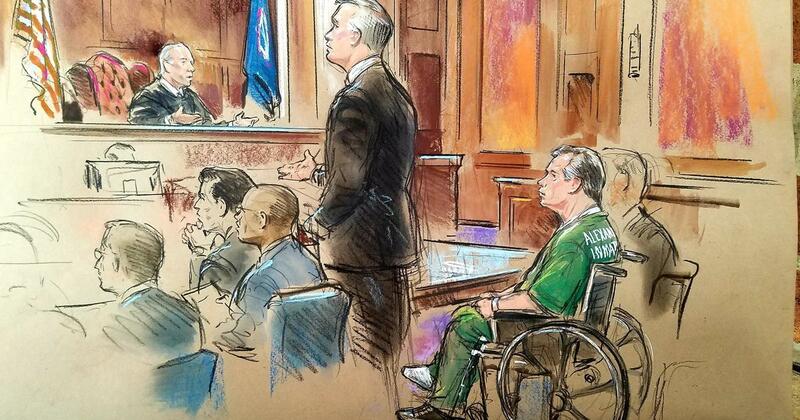 Manafort, who was denied the privilege of wearing a suit to today’s hearing, was wearing his green jumpsuit which said “Alexandria Inmate” on the back, courtesy of the Alexandria Detention Center. 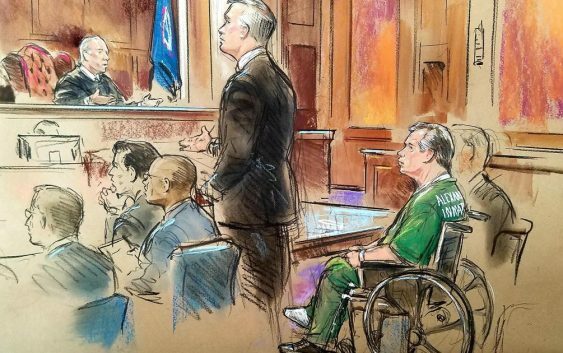 To the surprise of onlookers, Manafort was wheeled in and out of court in a wheelchair. His lawyers told the judge that they were eager to expedite the sentencing process, citing Manafort’s confinement as a reason for the “significant issues” with his health. He wore a white sock on his right foot and a shoe on his left. Before the former Trump Campaign Chairman ., he was in the Eastern District of Virginia. There was a mistrial declared on the ten other charges brought by the special counsel who, as part of the plea agreement, said that they would not retry Manafort on those charges and would dismiss them at sentencing in return for his cooperation. On Friday, Judge Ellis ordered that the outstanding charges be dismissed. “I will dismiss the deadlocked counts without prejudice,” he said. However, that is something that the special counsel has not done in the past. For example, Richard Pinedo cooperated in Mueller’s investigation that led to the indictment of 13 Russian nationals and three Russian entities back in February 2018, but was not given a reduced sentence recommendation, as his lawyer had anticipated. Before the trial, the government had estimated that Manafort would be sentenced to eight to 10 years in prison, based solely on the tax fraud charges in Virginia. Prosecutors, however, did not indicate Friday whether or not that estimate still stands, and ultimately the sentencing decision is up to the court. Manafort will be sentenced both in D.C., where he plead guilty to two counts, and Virginia, where he was found guilty on eight. Lawyers for both parties have agreed to recommend to the courts to allow the sentences for some charges to run concurrently as they deal with similar conduct. Prosecutors for the government had argued that the court should delay sentencing until they determined that Manafort had fulfilled the requirements of his cooperation as set forth in the plea agreement. However, Judge Ellis maintained that this case will be treated no different than others before him. “I do not extend sentencing in circumstances like this,” he said. Before his sentencing in February, Manafort will participate in what’s called a pre-sentence investigation report, which will take into account certain characteristics like his family, employment experience, and criminal history. That report will help recommend a guideline range so that Judge Ellis can determine what sentence to impose.